HUTCH is a kids’ literary and creativity magazine, published semi-annually under the direction of Peter H. Reynolds, with the help of The Blue Bunny Bookstore, and his non-profit foundation, The Reynolds Center for Teaching, Learning, and Creativity. The magazine is seeking student submissions. Submission details can be found, here. Deadline is Oct. 15. The magazine features stories, art, poetry, book reviews, travel logs and interviews submitted by students. The first issue of HUTCH was published in June of 2008. All children in grades K-6 are invited to submit their creative work for consideration for publication. Printed copies of the magazine may be ordered online or through The Blue Bunny Bookstore by calling the store directly at 781-493-6568. Printed copies may also be purchased in store at 577 High St, in Dedham, MA. 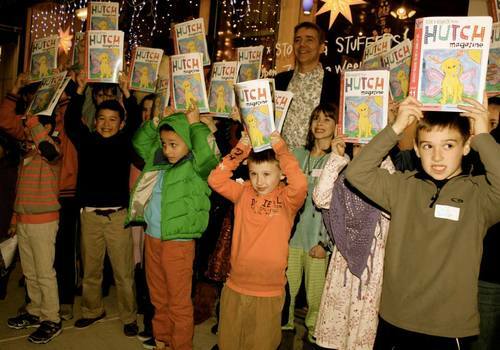 HUTCH magazine provides a validating forum for young learners to share their ideas and focus on positive values. HUTCH is an accessible resource for child educators wishing to encourage meaningful learning through the unique experience of being published. The suggested theme for the next issue is: "I Was Brave, I Am Brave, I Will Be Brave!" The deadline for submissions is Oct. 15, 2017. Issue 19 will be released in December.